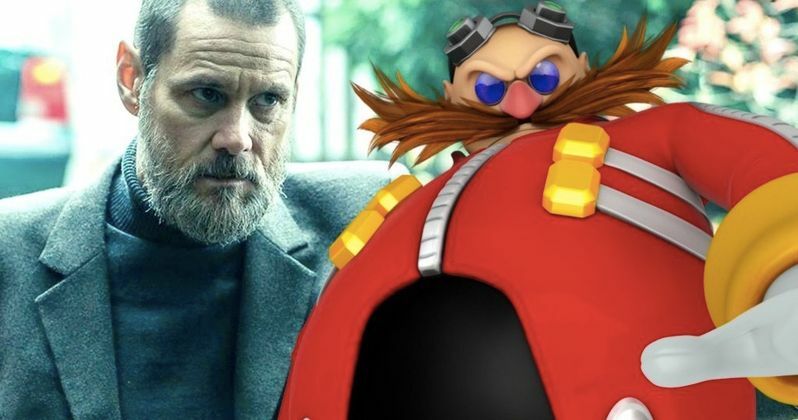 Jim Carrey is in negotiations to portray Doctor Robotnik, aka Eggman, in the Sonic the Hedgehog movie. It was announced at the end of May that James Marsden will star in the film, but it isn't clear which role he will have. Additionally, it's been reported that the production is trying to nail down Paul Rudd to play Sonic's police officer friend named Tom. The combination of Rudd, Marsden, and Carrey in the Sonic the Hedgehog movie could make for a box office success. Sonic the Hedgehog is going to blend live-action and CGI and will be directed by Jeff Fowler. Deadline reports that Jim Carrey is close to signing on to the project to play the evil Doctor Robotnik. Carrey could make for an excellent over-the-top version of the Eggman and he'll pretty much have room to stretch out and do his thing with the part. While the idea of a Sonic the Hedgehog movie didn't seem like the best idea on the planet, the addition of Carrey will surely see some extra ticket sales when the film hits theaters. Details are pretty scarce in regard to Sonic the Hedgehog other than the cast. It had previously been reported that the filming will begin at the end of July and that it will run through the end of October, but that has yet to be confirmed. However, a July start date doesn't seem too far-fetched at this point, especially since most of the cast has been nailed down. Paramount is serious about the Sonic the Hedgehog movie, giving the project a $90 million budget, which is pretty substantial for a video game movie. Sonic the Hedgehog will be a pretty big gamble for the studio. Video game movies aren't always at the top of the box office, so it will be interesting to see how well the movie does when all is said and done. The recent reboot of Tomb Raider earned over $270 million worldwide, but was considered by many to be a box office bomb. Now, we're talking about a speeding blue hedgehog that was at the height of its popularity back in the early 90s during the console wars. While the idea of a Sonic the Hedgehog movie still doesn't sound like a box office success, the studio is moving forward with a pretty intriguing cast. Jim Carrey as the villainous Doctor Robotnik will undoubtedly be bright spot when the film hit theaters at the end of 2019. Carrey was last seen in Dark Crimes as well as Jim & Andy: The Great Beyond. He's also starring in Showtime's Kidding, which premieres in September. Other than that, Carrey has been busy painting unflattering pictures of Donald Trump and his administration that he posts almost daily on social media. Head over to Deadline to read more about Jim Carrey starring in the Sonic the Hedgehog movie.